His Holiness Catholicos Aram has declared 2019 as “The Year of the Armenian Press.” Accordingly, by the directive of the Prelate Archbishop Anoushavan, all Prelacy parishes will read His Holiness’ 2019 message during the Divine Liturgy on Sunday, February 10. In his message, His Holiness writes that after a recent meeting with representatives of the Armenian Press in Lebanon, he deemed it appropriate to declare 2019 the Year of the Armenian Press. Acknowledging that the “Press” in current times has a more expansive definition, the Catholicos emphasizes that he is speaking primarily about the print media that includes daily, weekly, and monthly newspapers and magazines. His Holiness directs the dioceses under the jurisdiction of the Cilician See to take this opportunity and during this year feature the history and role of the Armenian Press through various events including seminars, conferences, lectures, exhibits, and publication of books that focus on the importance of the Armenian Press in the life of the Armenian people. His Eminence with parishioners after the Divine Liturgy. 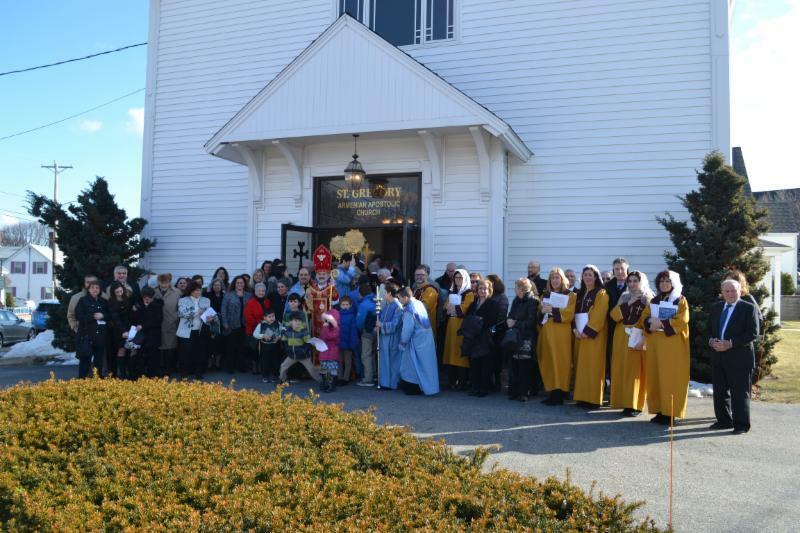 Archbishop Anoushavan travelled to North Andover, Massachusetts, where he presided over the 49 th anniversary of St. Gregory Church of Merrimack Valley. This was his first visit to North Andover as Prelate. 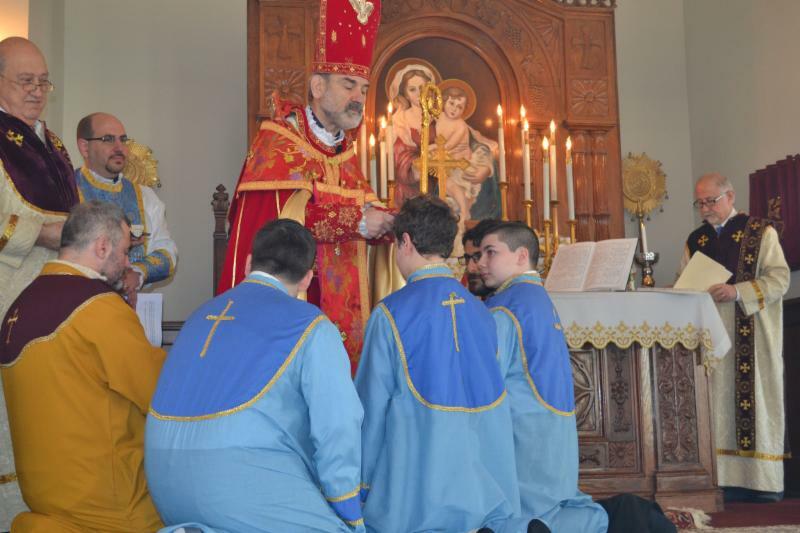 During the Divine Liturgy, His Eminence ordained four young men acolytes—Zareh Bulbulian, Aram Ozoonian, Edward Gaffny, and Armen Kourkounian. Mr. Bulbulian was also invested with a stole ( ourar ) to wear during liturgical services. A prayer of blessing was also said over choir director Knarik Nerkararyan and a blessed veil was placed over her head. In his sermon, the Prelate spoke about service and commended the young men and Ms. Nerkararyan for their continued service. He relayed how the higher orders of service to the church, beginning with the minor orders on up, show us that everybody has a role to play in serving God. He emphasized that each and every one has the responsibility to serve for the betterment of the church community and the glory of Christ’s name. 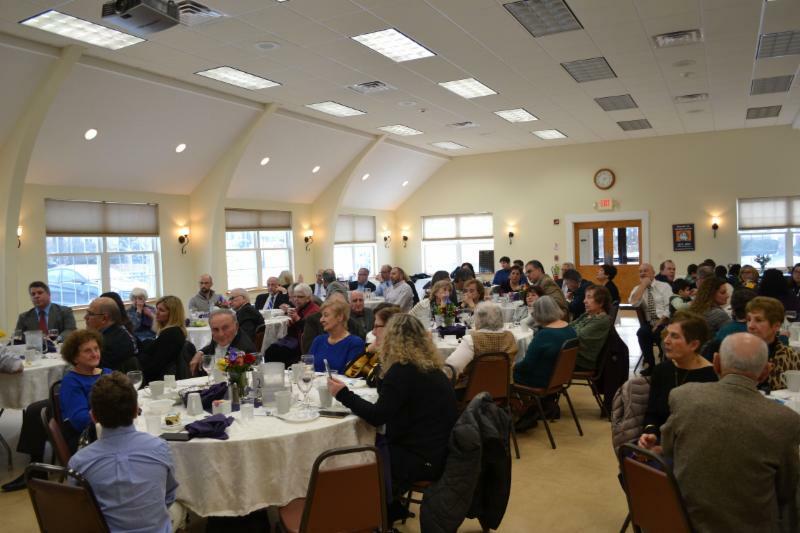 Following the Divine Liturgy and requiem service for all deceased leaders, benefactors, and workers, a celebratory banquet took place in the church’s Jaffarian Hall, with Archbishop Anoushavan presiding. 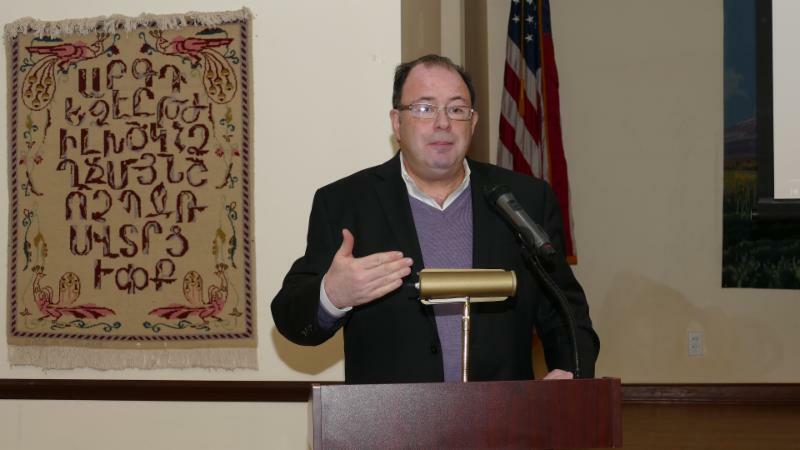 Krikor Afarian, Board of Trustees chairman, offered welcoming remarks and highlighted some of the successes and challenges of the past year. 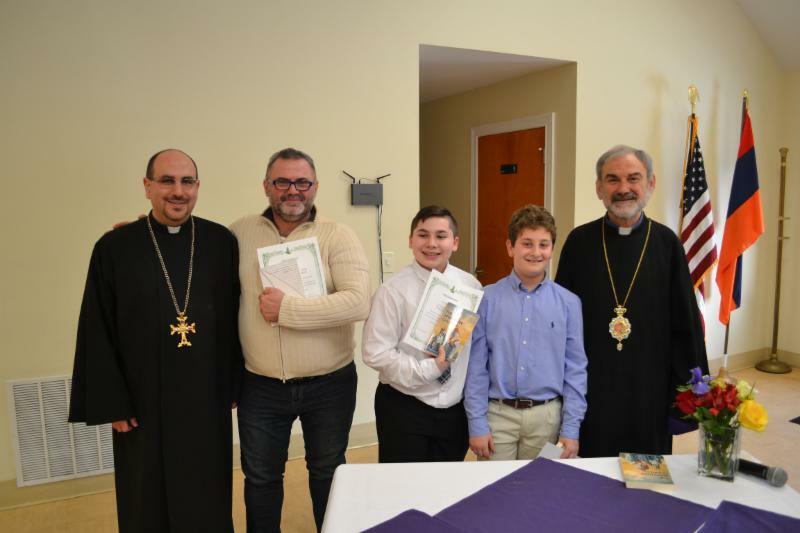 Keynote speaker, Deacon Arek Kalayjian, spoke eloquently about the Prelate and noted the ways in which he had encouraged and supported the St. Gregory community during his years as Vicar General of the Prelacy. Rev. Fr. Stephan Baljian, pastor, thanked the various committees and volunteers for their service over the past year. He also spoke about the Prelate and reflected upon some of the ways the Prelate had influenced life and ministry. Archbishop Anoushavan encouraged the community to remain strong and continue its dedication to the faith and character of the Armenian Church and Nation. The celebration ended with a birthday cake for the Prelate presented by Sunday school intern Meline Almasian, a recent recipient of the Prelacy’s Youth Leadership Award. Word is that His Eminence extinguished the candles in one breath. Archbishop Anoushavan will be at St. Sarkis Church, Douglaston, New York, where he will preside over the Divine Liturgy this Sunday, February 2. 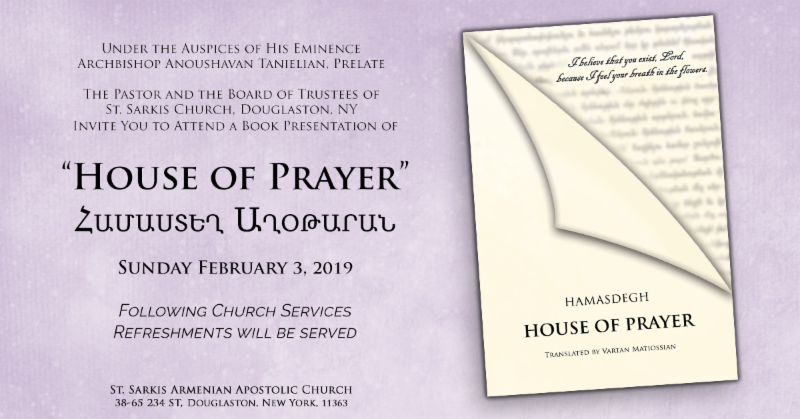 Following the services, His Eminence will preside and participate in a presentation of the recently published bilingual book, House of Prayer , by Hamasdegh. The book was translated and published on the occasion of the election and elevation of Archbishop Anoushavan and presented to each of the attendees at the celebratory banquet that took place on December 2. This exceptional and uplifting publication (English translation by Dr. Vartan Matiossian) is available at the Prelacy Bookstore. 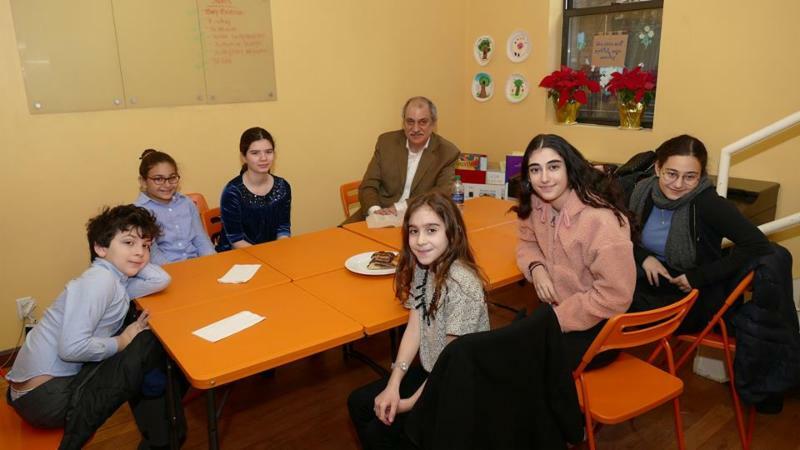 Archbishop Anoushavan attended a reception for the Aurora Humanitarian Initiative last Sunday evening that took place at the Diocese of the Armenian Church in New York City. The Prelate offered the closing remarks and benediction. 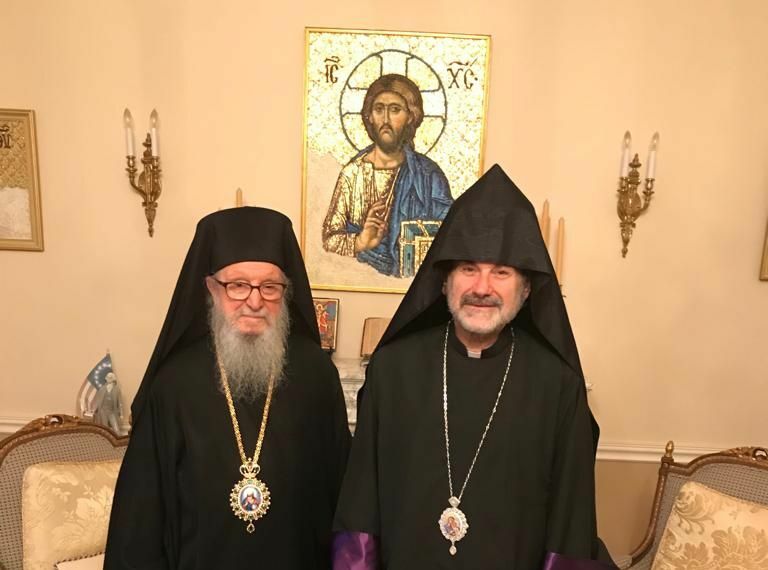 Archbishop Anoushavan met with His Eminence Archbishop Demetrios, Primate of the Greek Orthodox Church in America since 1999, on Tuesday, January 29. 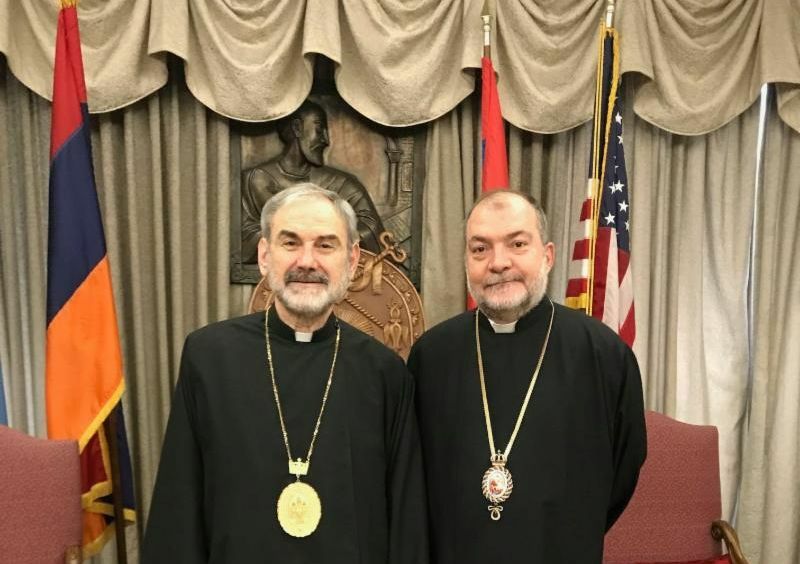 The two leaders of their respective church communities have known each other for many years, especially during the recent decades that Archbishop Anoushavan served as the Ecumenical Officer in the United States for the Catholicosate of Cilicia. They exchanged their views on a number of issues of importance to Christians worldwide and pledged to work together in harmony and brotherhood. His Eminence Archbishop Khoren Doghramadjian, Prelate of Cyprus, and Sebouh Armenagian, chairman of the Executive Council of the Prelacy of Cyprus, visited Archbishop Anoushavan at the Prelacy offices on Tuesday, January 29. The two prelates met and discussed various topics related to the Church. Afterwards, the guests sat down for lunch with the Prelate, Rev. Fr. Mesrob Lakissian, pastor of St. Illuminator’s Cathedral, and Prelacy staff members. The guests ended their visit after going to St. Illuminator’s Cathedral. The Eastern Prelacy has presented the annual Musical Armenia concert since 1982, bringing many talented artists of Armenian descent into the limelight. This year’s concert that will take place at 2 pm, on Sunday, March 17, is the 36 th concert in the series. The concert will feature Cara Pogossian, Viola; Edvard Pogossian, Cello; and Vatche Jambazian, Piano. The program includes the music of Bach, Beethoven, Brahms, Komitas, Mirzoyan, Mansurian, and Spendiarian. The concert venue is Weill Recital Hall at Carnegie Hall, West 57 th Street and Seventh Avenue in New York City. Tickets ($25) can be purchased at the Carnegie Hall Box office (212-247-7800); and at the Armenian Prelacy (212-689-7810). The Prelacy is able to present this annual concert as a contribution to the artistic achievements of the community thanks in large part to a group of dedicated patrons who offer their financial support each year in order to cover the cost and keep the price of tickets affordable for all. Throughout Musical Armenia’s 36 year history the price of admission has been kept low thanks to the support of dedicated sponsors. As a sponsor you can make a key contribution to the development of talented musicians as they strive for success in their various musical fields. All donors are acknowledged in the concert booklet. The categories of sponsorship are: Diamond $1,000; Platinum $500; Gold $300; Silver $200. Diamond, Platinum, and Gold sponsors will receive two complimentary tickets. 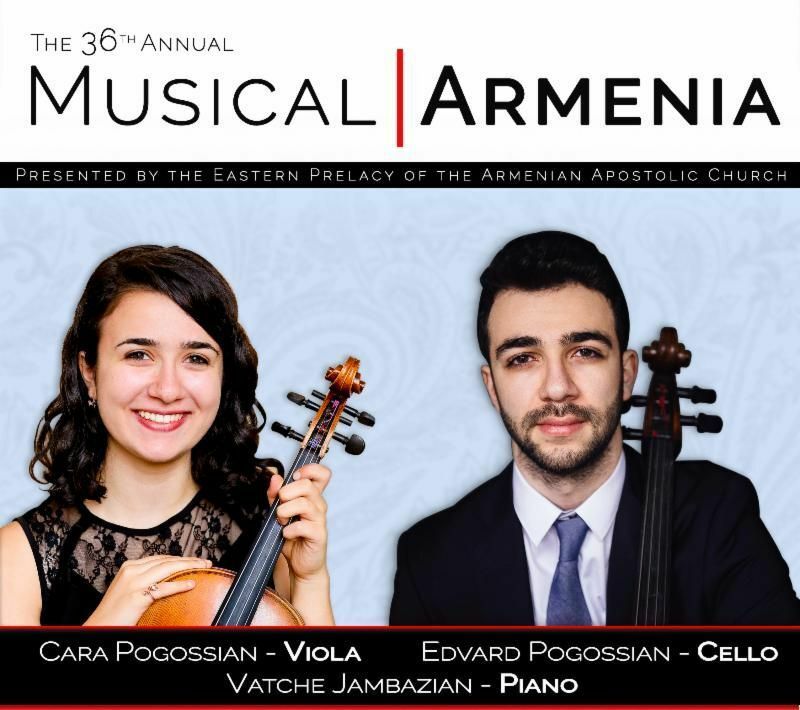 ﻿For more information or to become a sponsor of Musical Armenia contact Sophie by email ( sophie@armenianprelacy.org ) or by telephone (212-689-7810). Bible Readings for Sunday, February 3, Third Sunday after Nativity are: Isaiah 62:1-11; 2 Timothy 2:15-19; John 6:39-47. This Saturday, February 2, the Armenian Church commemorates Saint Gregory the Theologian, also known as St. Gregory of Nazianzus, who is considered to be one of the great fathers of the Eastern Church. He was the son of the bishop of Naziansus in Cappadocia. A great orator, his famous Five Theological Orations were powerful statements of faith and an eloquent defense of orthodoxy that earned him the title “the Theologian.” He also wrote poetry, letters, and with St. Basil compiled a selection of writings by Origen. Monday, February 4: Sts. Maccabees: Eleazer and her seven sons. FROM OUR PARISHES. . .
Deacon Dickran Kabarajian and Sona Parnagian. After the Divine Liturgy last Sunday, St. Illuminator’s parishioners evoked the memory of Hrant Dink, founding editor of Agos weekly, who was an outspoken defender of Turkish-Armenian reconciliation and human and minority rights in Turkey until his assassination in 2007. Rev. Fr. Mesrob Lakissian, pastor, invited the audience to observe a minute of silence in honor of Dink’s memory. The keynote speaker was Dn. Dickran Kabarajian, who presented Dink’s life and work, and especially his daring exploration of controversial issues and criticism of Turkish denial. 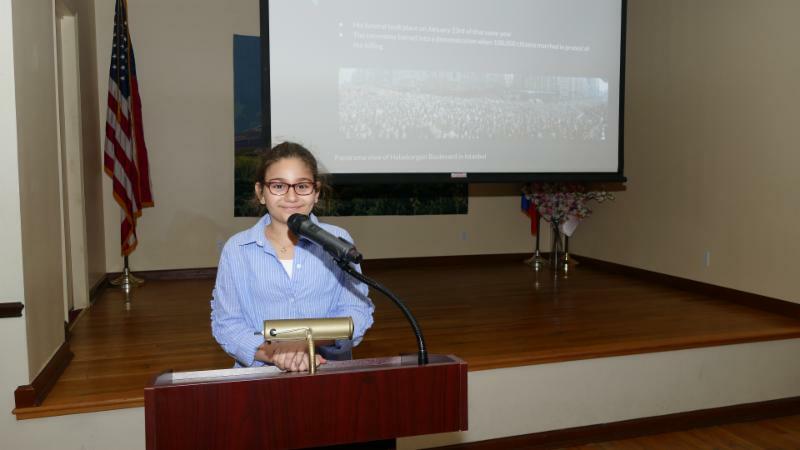 Sona Parnagian, a Sunday school student and member of the Manhattan “Moush” AYF chapter, presented a slideshow about Dink’s life and writings, as well as the details of his murder and its impact throughout Turkish society. FROM OUR SCHOOLS. . .
Deacon Shant Kazanjian with the students. Last week the Armenian Church commemorated the Feast of the birth of St. John the Baptist, also known as John the Forerunner (Garabed). Deacon Shant Kazanjian visited the Sunday school and spoke about St. John’s role in the life and the ministry of Jesus Christ. Hovhannes Kajaznuni was an important political figure, particularly in the crucial years of 1917-1920, and became one of the founding fathers of the Republic of Armenia as its first prime minister. He also was an accomplished architect, with important work done in Baku before the Russian Revolution and Armenia after the sovietization. He was born on February 1, 1868, in Akhaltskha (now Akhaltsikhe in the region of Javakhk, Georgia). His family was originally from Erzerum. 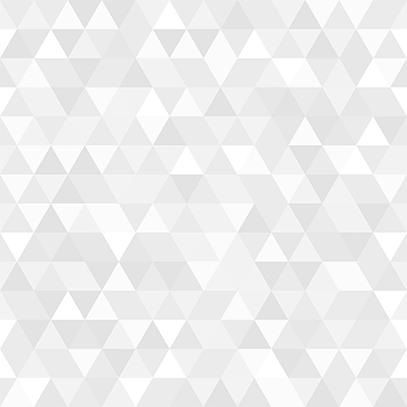 Their original surname was Igitkhanian, and his great-grandfather, a priest called Ter Hovhannes, had received permission from the Catholicos of All Armenians to change the surname to Ter-Hovhannisian. At his turn, his great-grandson translated the family name into Armenian, turning Igitkhanian into Kajaznuni; igit means “brave” in Turkish ( kaj in Eastern Armenian, kach in Western). 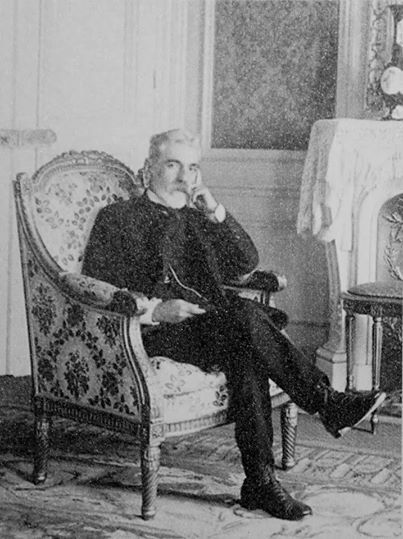 Kajaznuni studied in Tiflis from 1877-1886, first in a private school and then in the royal school. In 1887 he entered the Institute of Civil Engineering in St. Petersburg. Two years later, he married Satenik Mirimanian, despite her father’s opposition. They would have six children (four boys and two girls), and they would lose three of them to the service of the homeland. Ashot would die in the aftermath of his participation in the battle of Gharakilise (1918); Aram would die in the summer of 1920 fighting Tatar rebels in the region of Zangibasar (Masis); Ashot’s twin brother, Ruben, would be taken prisoner and killed by the Turks after the occupation of Kars (1920). In his last years of studies, Kajaznuni joined the Armenian Revolutionary Federation. He graduated in 1893 with the title of architect. He moved to Baku, where he worked as engineer-architect in the regional architecture department from 1893-1895. After working for two years as an architect in Batum, from 1897-1899 he was a district architect for the municipal administration of Tiflis. He returned to Baku in 1899 and worked for the next seven years in the Oilmen’s Council as chief architect. He designed a hospital, residential buildings, and hotels in the area of Balakhan. He was also the designer and builder of the Cathedral of St. Thaddeus and Bartholomew in downtown Baku from 1907-1911, which would be destroyed by the Soviet Azerbaijani regime in the early 1930s. Meanwhile, Kajaznuni had actively entered political life in 1906, becoming a member of the committee to end the Armeno-Tatar conflict in Baku. In 1909 he was arrested by the Russian police within the case that had been opened against the A.R.F. and left the empire in 1911 to avoid testifying in the trial. He lived in France, Belgium, and in the city of Van, in Western Armenia, where he wrote various articles in Russian on Shakespeare. Returning to the Caucasus in 1914, he was elected a member of the Armenian National Council in 1917 and, after the Russian Revolution, he was elected to the Transcaucasian Parliament (Seim) in February 1918. In the critical days of May 1918, Kajaznuni was a member of the Armenian delegation that participated in the conferences of peace in Trabizond and Batum. He was among the signatories of the Treaty of Batum on June 4, 1918, a few days after Armenia had declared its independence. After the foundation of the Republic, Kajaznuni was designated first Prime Minister. The cabinet moved to Yerevan from Tiflis on July 19, 1918. In October, under pressure from the Council (Parliament) of Armenia, Kajaznuni resigned, but was charged by the Council with the formation of a new coalition government. The coalition was formed by the A.R.F. and the Armenian Populist Party, and would last until June 1919. Meanwhile, in April 1919 Kajaznuni traveled to the United States as part of a delegation to negotiate political and economic help to Armenia, and left the position of prime minister to Alexander Khadisian. He returned to Armenia in September 1920 and was named vice-president of the Parliament, becoming president in the last days of the Republic, on November 25. After the sovietization, Kajaznuni was arrested and spent a month and a half in prison, until he was liberated by the February rebellion. In April 1921, after the failure of the rebellion, he left Armenia and lived in Iran, India, Egypt, and Romania. He wrote a report on the party’s situation, The Armenian Revolutionary Federation Has Nothing to Do Any Longer, which was published in 1923 and generated a big controversy. In 1924 he returned to Soviet Armenia. He taught architectural planning at Yerevan Statue University and was a member of the technical council of the Institute of State Planning. He designed and directed the construction of cotton factories in Yerevan and Sardarabad, oil and soap factories in Yerevan, and housing for workers. He also built various buildings in Leninakan (nowadays Gyumri) after the earthquake of 1926. Kajaznuni was a victim of the Stalinist purges. His past condemned him. He was arrested in 1937 and died on January 15, 1938 from pneumonia in the prison of Yerevan. Otherwise, he had been condemned to be shot on December 5, 1937, but the prison doctor had temporarily postponed the sentence. His archives were confiscated and disappeared. Kajaznuni was rehabilitated in 1955, but his name remained in the shadows until the end of the Soviet period. According to certain data, the first primer minister of the Republic of Armenia was buried in the cemetery of Kozern, in Yerevan. However, the cemetery was later destroyed and his tomb was lost. Thanks to the efforts of Kajaznuni’s daughter Margarit, a symbolic tombstone was erected in the city cemetery of Tokhmakh Lake. Previous entries in “This Week in Armenian History” are on the Prelacy’s website ( www.armenianprelacy.org ). The fighting and bombs have stopped. Now the difficult process of rebuilding has started. Please continue to keep the Armenian community in Syria in your prayers and pocket books. AND SELECT SYRIAN ARMENIAN RELIEF IN THE MENU. This Saturday, February 2, is Groundhog Day. The earliest American reference to Groundhog Day is in the diary of James Morris, a resident of Morgantown, Pennsylvania. On February 4, 1841 he wrote: “Last Tuesday, the 2 nd , the day on which, according to the Germans, the groundhog peeps out of his winter quarters and if he sees his shadow he pops back for another six-week nap, but if the day be cloudy he remains out, as the weather is to be moderate.” Morris’s diary is preserved at the Pennsylvania Dutch Folklore Center on the campus of Franklin and Marshall College. We would love to know your thoughts about and suggestions for our weekly Crossroads electronic publication, and we have set up a special e-mail address for your comments. 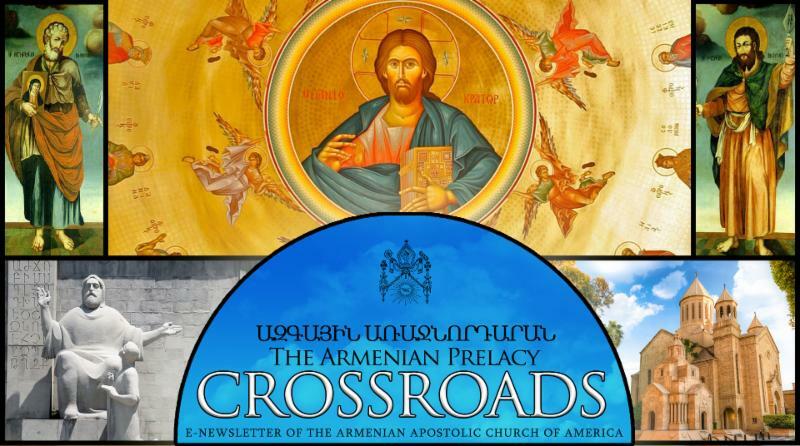 Write to us at crossroads@armenianprelacy.org . SIAMANTO ACADEMY— Meets every second Saturday of the month at the Hovnanian School, 817 River Road, New Milford, New Jersey. For information: anec@armenianprelacy.org or 212-689-7810. February 8 & 9— Ordination of Deacon Vahan Kouyoumdjian to the Holy Order of Priesthood at Sts. Vartanantz Church, 461 Bergen Boulevard, Ridgefield, New Jersey. Friday, February 8, Ceremony of Calling, at 6 pm; Saturday, February 9, Ceremony of Ordination and Consecration during the Divine Liturgy, 10:30 am. The Prelate His Eminence Archbishop Anoushavan will officiate. Very Rev. Fr. Sahag Yemishian, Vicar, will sponsor the candidate. February 16 —Valentine’s Day Dinner Dance, sponsored by Armenian Relief Society New Jersey Shakeh Chapter; 8 pm at Assyrian Orthodox Church of Virgin Mary, 644 Paramus Road, Paramus, New Jersey. Entertainment by: Zareh Kasbarian and his band from Washington, DC; Sako Tashjian from Montreal, Canada; Garo Torossian from New Jersey; Keyboard by Maestro Vicken Makoushian. Net proceeds will benefit ARS programs and Sts. Vartanantz Church. Donation: $75. Appetizers, Dinner (catering by Sultan Cuisine); BYOB. For information and reservations: Maral Kaprielian (201-289-6486); Seta Asadurian (201-320-2859). March 17 —Annual Musical Armenia concert sponsored by Eastern Prelacy, 2 pm, at Carnegie Hall’s Weill Recital Hall. Featured artists: Edvard Pogossian, cello; Cara Pogossian, viola; Vatche Jambazian, piano. May 5 —60 th anniversary of Sts. Vartanantz Church, Ridgefield, New Jersey. SAVE THE DATE. October 9-12 —On the occasion of the Feast of the Holy Translators a clergy conference of the Eastern, Western, and Canadian Prelacies will convene in Montebello, California. Details will follow. October 19 —Armenian Friends of America present the Annual Hye Kef 5 Dance, featuring The Vosbikians, at Double Tree by Hilton Hotel, Andover, Massachusetts. Tickets purchased before September 13 will include the Great Venue, Buffet, Vosbikian Band, and five Free raffle tickets. Adults $75; Students 21 and under $65. Specially priced AFA rooms available through September 17. For tickets and information contact: Sharke’ Der Apkarian at 978-808-0598; or John Arzigian at 603-560-3826. Also visit www.ArmeniaFriendsofAmerica.org .